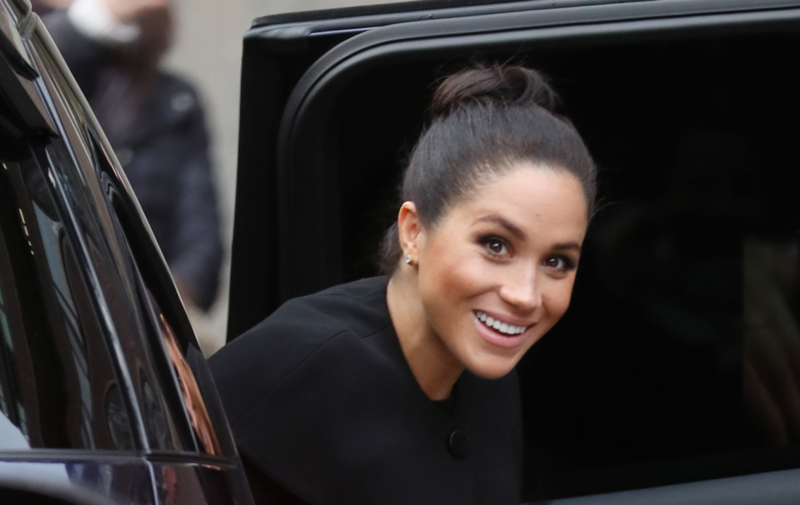 Meghan Markle, who is approximately 7 months pregnant by our calculations, stepped out in London on Thursday to make her first official visit to the Association Of Commonwealth Universities as an appointed patron. Re-wearing a long black Givenchy coat she counts among her favorites, the Duchess of Sussex stuck with what’s become something of a sartorial formula for her maternity wear: coat + dress + pumps + bun = pregnant Meghan. That’s not to say she hasn’t infused each look with an element of surprise. This time, she paired her black dress with sister-in-law Kate Middleton’s go-to beige pump, and wore her bun at a foreign longitude: atop her head. Yesterday, she surprised us with an above-the-knee hemline (an unorthodox choice Middleton opted for during her pregnancy as well), and during her visit to Birkenhead earlier this month, she abandoned her typical neutrals for a burst of brights.